The history of how we came to have the Government body that regulates pharmaceutical drugs and medical devices wasting their time on homeopathic products is long and complicated. However, as a result of lobbying by homeopaths, the EU created Directives that mandated countries to create regulatory schemes for these sugar pills. 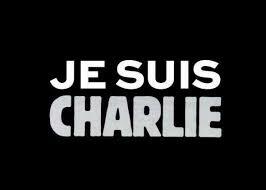 Unfortunately, it fell to the UK’s medicines regulator to implement the rules and enforce them. However, with the false imprimatur that statutory regulation gives their products comes the duty on homeopaths to abide by all the regulations as well. They can’t have one without the other and it would be hoped that responsible manufacturers would ensure they were fully compliant. It seems not. After a number of complaints (not from me or the Nightingale Collaboration), the MHRA wrote to Helios and Ainsworths on 5 September 2011. [1, 2] In their letters, the MHRA tell the homeopathic manufacturers what individual products are currently registered — 18 for Helios and 33 for Ainsworths. 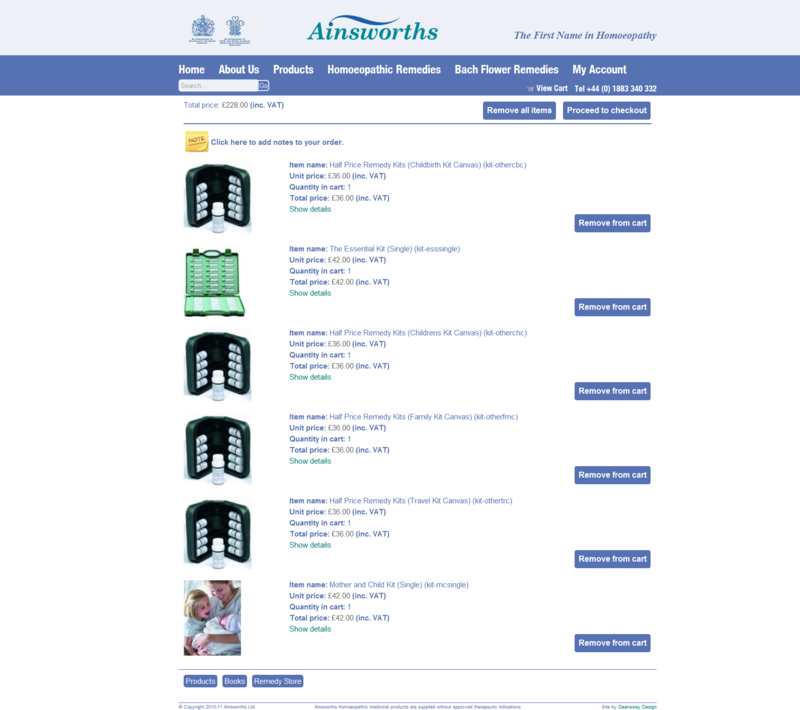 It also appears that they had just one kit of homeopathic products each registered: the registered name for Ainsworths’ kit was ‘Ainsworths Homeopathic Kit Number 1′ and Helios’ was ‘Helios Basic 18 Kit’. However, the MHRA noted that Ainsworths were selling five other kits and Helios four others on their websites, none of which were registered. Additionally, all these additional kits contained a number of homeopathic products that were neither registered nor authorised. As you are already aware, in order to sell or supply a homeopathic remedy within the UK, it must be either registered under the Simplified Registration Scheme or authorised under the National Rules Scheme or be the subject of a Product Licence of Right. Registration or authorisation is compulsory for products new to the UK market. The remedy kits currently being marketed by [Ainsworths/Helios] contain remedies that have not been authorised or registered and are being marketed under names that have not been agreed by the MHRA and are not in accordance with the registration certificates granted. a. the kit names have not been agreed by the MHRA and are not in accordance with the registration certificates granted. The only product that may currently be marketed is the Basic 18 Kit. 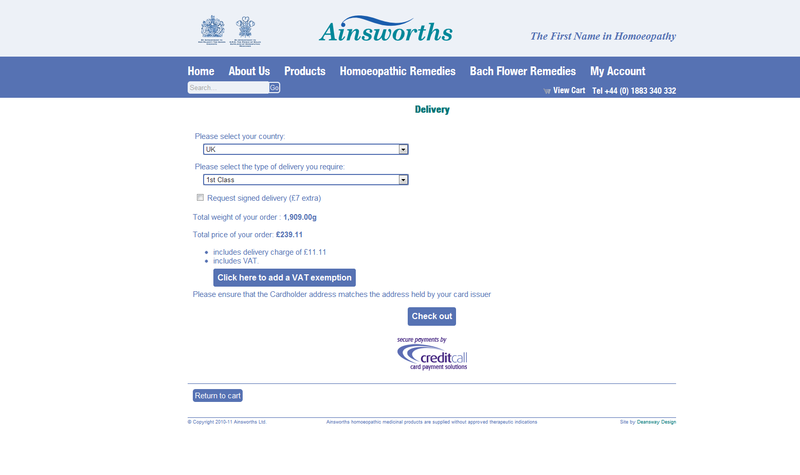 If you wish to market a kit then it must be named Ainsworths Homeopathic Kit Number 1 and may only contain remedies that are registered. You should confirm in writing within fourteen days of the date of this letter that you have received it and understand the contents. A timeframe for discontinuing the sale and supply of the remedy kits listed above should be provided. If you are not able to provide in writing confirmation that you will act in accordance with the requirements of this letter, the matter will be referred to out Enforcement Group. The letter is signed by an MHRA ‘Scientific assessor’. His or her views on the selling of sugar pills as medicines are not recorded. We have been supplying these kits for over ten years and rely on them as a substantial part of our business. In addition the reputation of these kits has spread globally and a number of them are sold outside of the EU. Therefore we are keen to proceed with licensing those elements of the kits, which are currently unlicensed. Homoeopathy, as you will no doubt be aware, has been suffering considerable attacks in the media and the whole industry is suffering a downturn as a result. McCarthy-style reporting, encouraged by the self-appointed detractors of homoeopathy, together with intransigence towards homoeopathy by the ASA [Advertising Standards Authority], has protracted this decline, without serving public purpose, to an industry that has served many. If anyone is aware of an organisation, or indeed a statutory body, that appoints official detractors, then please let me know. They then ask for one year in which to comply with the MHRA’s demands while they register their unlicensed products. Because of this lack of progress despite numerous enquiries and eventually a complaint letter, we considered that it was not worth us continuing with an expensive and slow process when the MCA did not consider the issue of unlicensed kits a priority. It should also be noted that both we and our competitors had supplied unlicensed kits since the early 1990’s on the request of our customers with the MCA full aware at both regulatory and inspection level. Not once, either by an MCA/MHRA inspector or regulatory official, were we advised to actually remove the kits from sale and this issue has not arisen until now when a small group of sceptics started lobbying the MHRA. If it wasn’t for those darned sceptics, eh? And how is making a complaint to a statutory regulator about an issue that the regulator subsequently upheld as a breach of the Medicines Regulations, an abuse of the neutrality of the MHRA? Dealing with complaints is part of their remit. I’m sure the MHRA are perfectly capable of acting independently, without advice from a manufacturer. Therefore we do not consider that these complainants should be driving the resolution of the historic and complex issue of unlicensed kits and remedies. A few MPs are unaware of the undemocratic sceptic campaigns, as are the homeopathic community, and some are asking what action they can take. It may be an historic issue and Helios may see it as complex, but it seems to me all we’re talking about is some paperwork and some money. It’s not as if registration of products or kits requires any of those expensive RCTs to prove efficacy: it’s just a matter of an adequate manufacturing process (remember that they already have other products registered) and agreement on what the kits are called. Doesn’t sound as if that should be a major hurdle, if the will to comply with the Medicines Regulations was there. I attach an example of the twitter dialogue one of the complainant’s uses [sic], which show a persistent anonymous complainant boasting about how his blitz e-mail tactics have pressured the MHRA into generating a list of homeopathic licensed products in an attempt to push unlicensed remedies off the market completely. This was clearly the case and obviously these tactics are working. The letter doesn’t say why they thought the MHRA might be at all interested in their speculations about specific skeptics and/or complainants when the issue at hand is the sale and supply of unlicensed homeopathic medicines in breach of the Medicines Regulations. Helios’ letter goes on about how they thought the responsibility of unlicensed remedies supplied from a pharmacy had been passed to the General Pharmaceutical Council and they complain about the difficulties they have with the proposed consolidation of the Medicines Regulations. They then try to persuade the MHRA to push their applications to have some of their unlicensed kit remedies through as quickly as possible. If necessary we could revise the manufacturing method, the labelling of the bottles and kit box to present them as non-medicines and non-homeopathic and market them as ‘confectionery’. Customers who have an interest in homeopathy would still know how to use them and would continue to purchase them despite limited labelling. There would of course be media repercussions and uncontrolled sources appearing and confusion among the public and MPs who would demand a full explanation for the change. This is an option which our customers would support if it ensured a continuation of the supply of kits until they are fully licensed. However this is not our wish as we respect the remit of the MHRA, the efficacy of homeopathic remedies and their continuing status as medicines. There are, of course, many problems with trying to avoid the Medicines Regulations by not presenting homeopathic products as medicines, particularly when they admit that their customers will still know that they really are still homeopathic ‘medicines’. But I wonder how they were thinking of revising their manufacturing method? Not starting out with any Mother Tincture perhaps? Or only doing half the ‘proper’ number of succussions? Surely not omitting to dilute them? Who knows? But since the only way to tell any of them apart is by what it says on the label, it really doesn’t matter how they change their manufacturing process (as long as they dilute adequately), they will still all be identical little sugar pills that have no pharmacological effect. The final request asked the MHRA for more time so they could get the unlicensed products properly registered and so they ‘could be clearer as to the details of our future actions’. I thought that their ‘future actions’ had already been spelled out very clearly by the MHRA. As discussed in my previous letter dated 5th September 2011, in accordance with the Medicines Regulations a homeopathic remedy must be either registered under the Simplified Registration Scheme or authorised under the National Rules Scheme or be the subject of a Product Licence of Right, in order to be sold or supplied in the UK. We are unable to deviate from this legal requirement and therefore only the [33 for Ainsworths/18 for Helios] remedies registered under the Simplified Registration Scheme can be currently marketed in the UK. The MHRA then repeated the actions Ainsworths and Helios were required to take, this time requesting confirmation within seven days. Seven days later on 10 January, Ainsworths replied giving a timetable for submissions for 42 Simplified Scheme registrations over the following months. They also told the MHRA they had discontinued the UK advertising of the kits and needed a further six months to discontinue sales and supply within the UK. It is requested that Ainsworths cease sales and supply on the non-registered kits immediately. Outlets that you have already supplied the kits to may sell through the stock but must not be supplied with further kits. …wind down the operation and inform the retail outlets that we are replacing at least one kit as seamlessly as possibly without destabilizing our market. Apparently, it would also take them time to contact their customers and explain the situation. We are unable to approve your request for a time frame of six months to inform UK retail outlets of the change and you should discontinue supply of the unregistered kits to them with immediate effect. On receipt of this email, please confirm in writing that you will cease supply of the unregistered kits in the UK with immediate effect. That was on 26 January 2012 and Ainsworths replied five and a half hours later — and nearly four months after the MHRA’s initial letter — finally indicating that they had complied. The communications with Helios were similar, with an admission that they had been trying to agree a ‘mutual timing of action but without success’. All advertisements for selling the unauthorised kits within the UK must be removed from the website with immediate effect. Sale and supply of the unregistered kits in the UK must cease immediately. On 6 February 2012, after a further demand from the MHRA for confirmation, Helios told them that — five months after the MHRA’s initial letter — they had complied. The Medicines Regulations are perfectly clear and it is obvious that manufacturers of homeopathic products have known for some time that unlicensed products could not be sold or supplied in the UK. Even if they weren’t aware of the regulatory regime they are supposed to work under — or had forgotten about it — the FOIA response also shows that Helios were consulted on the MHRA’s Draft Guidance on Advertising Homeopathic Medicines, the final version of which was published last March. Indeed, Helios submitted comments on an earlier draft and there is no reason to suppose the other manufacturers weren’t also consulted. Advertising of unlicensed medicines in the UK is prohibited. Therefore homeopathic products which do not hold a current registration or authorisation under one of the above schemes [HR or NR] must not be advertised. Remedy kits advertised for specific indications, e.g. “Childbirth Kit”, may only contain products that are licensed by the MHRA and that have indications (or usage within the homeopathic tradition for Simplified Scheme products) that are relevant to the condition. No product claims can be made for any other kit. Considering this very specific mention of “Childbirth Kit”, it’s surprising that Helios were still advertising a kit with that name six months later when they MHRA told them of the complaint they’d received. …will be removing the word ‘Childbirth’, from the packaging box for the collection of remedies we call the ‘Childbirth’ kit, within the next few months (June/July 2011) when case stocks are depleted. They confirmed to the MHRA they had made the necessary changes to their website to bring it in line with the guidance on 17 May, so how was anyone able to complain about this very same kit in September? However, are Helios and Ainsworths now complying with the Medicines Regulations as they told the MHRA they were? In the discussions with the MHRA, Helios were told that ‘adverts for selling unregistered kits with the UK must be removed from the website’. Helios apparently wanted to continue advertising and selling to their overseas customers — something outside of the MHRA’s remit. …with the price in £, of course, and the UK as one of the destination options with a choice of 1st or 2nd Class postage, and seemingly nothing preventing a UK customer from placing an order and paying by credit card. Presumably, if you were in the UK and ordered one of the unregistered kits, Ainsworths would refuse to sell it and refund your money? Whether the changes they have made to their websites is sufficient to convince the MHRA that Helios and Ainsworths are complying with the regulations is something the MHRA will have to decide. 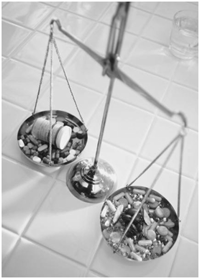 But like it or not, the Medicines Regulations exist and abiding by them is not optional — even for homeopaths. This bitter pill may be hard to swallow and they are now submitting some of their unlicensed products to the MHRA so that they can start to sell them as properly registered products. However, that still leaves the unresolved problems of Helios’ 2,495 and Ainsworths’ 3,355 homeopathic products on their website that would appear to be unlicensed homeopathic ‘medicines’. More on those next time. Note that there were 9 other files in this response, but they were mainly duplicates of emails. The MHRA has not yet published these documents on their website under their disclosure scheme. It strikes me that the MHRA have allowed both Ainsworths and Helios an undue amount of time to comply (which they have only partially done). This maybe because they regard unregistered homeopathic medicines as a low priority in terms of public health. I imagine that they act much more quickly in the case of unlicensed medicines that contain active ingredients. If they “revise the manufacturing method”, on what basis would a consumer of homeopathy assume the product to the same as it used to be? And isn’t labelling uber-important in homeopathy – to the point where you only need to stand a bottle of pills on a handwritten label in order to imbue it with the magic? And, given the inverse nature of homeopathic remedies, would a “confectionery” label mean the pills will make users lethargic? So their justification for being allowed more time is that they ignored the law when they were told about it, presumably hoping that it would continue not to be enforced, despite the MHRA giving very clear indications otherwise. In MHRA’s position I would refer them to the reply given by the respondents in Arkell v. Pressdram. Not once, either by an MCA/MHRA inspector or regulatory official, were we advised to actually remove the kits from sale and this issue has not arisen until now when a small group of sceptics started lobbying the MHRA. We protest that anyone has shopped us for breaking the law?? I’m sure that will go down well as defence in court. So we aren’t “genuine members of the public”? Next they will accuse us of all being the same person. The similarity between homeopathy and religion, in every practical respect, is uncanny. Coincidentally so is its similarity to a medical scam. How does one go about acting like a ‘normal member of the public’? Is there a course we can take? The above going on are in the UK. There is an article that appeared many years ago on the effectiveness of homeopathic remedies to state that these are not sugar and water. What is the truth behind it? Please keep to the topic of this blogpost – the MHRA and unlicensed homeopathic ‘medicines’ and kits. 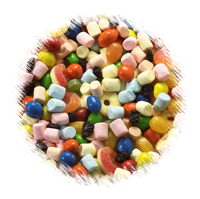 The blog writes about the ” Sugar coated nonsense” and ” Ingredients – Sucrose 0.2g, Other ingredients None, Active ingredients None”. I put in a paper that shows this is not true. The report shows such sugar pills to provide results superior to the conventional medicine. What would you say of the report that goes on to state that this is part of the parliamentary records in UK? 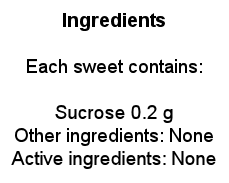 Here also the results of Sucrose 0.2 gms +++ are far superior to the conventional medicine. One thing is clear: If the results are so dramatic, it cannot be just sugar coated nonsense. Am I expected to be impressed by what you, yourself wrote in a report and submitted to Parliament? No, it is not clear. Not until you have eliminated all other possible, simpler, more probable and more plausible explanations. That, you have not yet done. I did not write the report. It was available on the net. I provided the link. Does it create a problem? The report from America is also not written by me. I only provided the link. It seems to eliminate – self curing disease notion ~(people were dying), anecdote (to many people getting well). What could be the simpler more probable and more plausible explanations? It seems Aspirin was killing people. I appreciate English may not be your first language and no doubt you are better at speaking English than I would be speaking your first language. However, your comments are difficult to understand. I put in a paper that shows this is not true. That looks to me like a claim you had written a paper. So it seems like you were talking about one paper you wrote, then move on to talk about something else written 90 years ago and is just someone’s opinion, unsubstantiated and unsubstantiatable personal anecdotes. Unsubstantiated and unsubstantiatable personal anecdotes? It only would have made a difference to the patients of these homeopath doctors. This was meant to be sarcastic.